Tonight is the night! 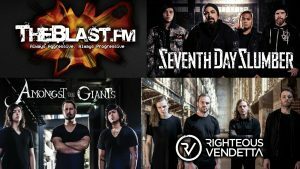 Seventh Day Slumber, Righteous Vendetta and Amongst The Giants play in Sioux Falls at 7 pm at the new Lifelight building, 420 S. Duluth Avenue…west door of west bldg on the First Christian Church campus…and it also streams online. Meet and Greet starts at 6:00 pm. Tickets for M & G + concert are $20; doors for general admission open at 6:30 pm Tickets at the door for general admission are $15. The online ticket portal is turned off. However, if you’d like to still buy a last minute ticket to the live stream, fill out the Blastback Contact form, and we may be able to get you in. If so, it will require a $20 online payment through Paypal. But check with us first through the contact form. We are in concert mode.